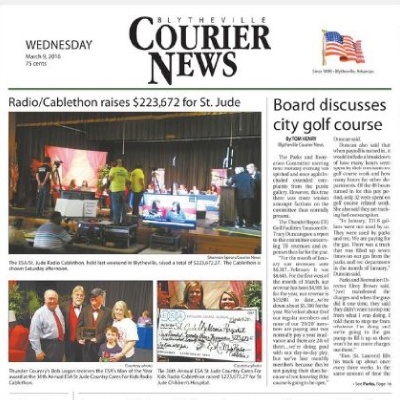 Ritter Communications is pleased to announce $223,672 was raised at the 36th Annual St. Jude Country Cares for Kids Radio and Cablethon Friday and Saturday, March 4 and 5, 2016 in Blytheville, Arkansas. All money raised benefits St. Jude Children’s Research Hospital, one of the world’s premier centers for the research and treatment of childhood cancer and other catastrophic diseases. This year Ritter donated $6725 from employee contributions. 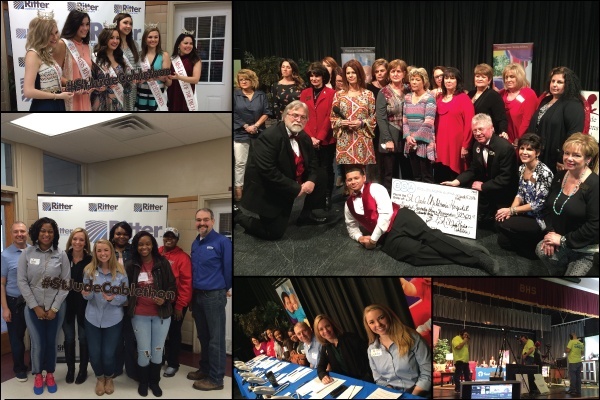 This is the ninth year Ritter’s local access channel, Tubetown, which is channel 21 in Northeast Arkansas and Southeast Missouri and channel 11 in West Tennessee, broadcasted the event LIVE from 10 am to 6 pm Saturday to thousands of Ritter cable TV customers. ESA Sorority, a women’s civic club established in Northeast Arkansas who has taken ownership of this event for many decades, presented the annual award of ‘Man of the Year” to Bob Logan, the morning show host on KHLS Thunder Country 96.3 FM. Thunder Country, a radio station of Sudburry Broadcasting established in Blytheville, promoted the radiothon and hosted many on air talent segments featuring patients and survivors from St. Jude Children’s Research Hospital all day Friday, March 4, 2016, to their Northeast Arkansas coverage area. “Marcus Carlton, the 2015 Best Man of the Year Award recipient, and Production Assistant Brandon Reid lead the Tubetown crew in the production of this year’s event and they do a fabulous job coordinating this program each year!” said Ritter Communications Marketing Director Jane Marie Woodruff. Click here to view a video from this year's event. Ritter Communications, founded in Marked Tree, Arkansas and headquartered in Jonesboro, began providing local phone service in 1906. Today, Ritter serves 59 communities and more than 45,000 customers in northeast and north central Arkansas, southeast Missouri and west Tennessee with advanced voice and data services, cable TV and high speed Internet typically found only in major metropolitan areas. Ritter invests heavily in the communities it serves by deploying proven, best in class infrastructure and technology while coupling it with a world class customer focused experience. To stay connected visit facebook.com/rittercommunications.